Entering the Division 3 at the European Masters in Bitburg 2016: Teams Area One and Rising Phoenix from Austria! Registration for the European Masters in Bitburg/Germany open! 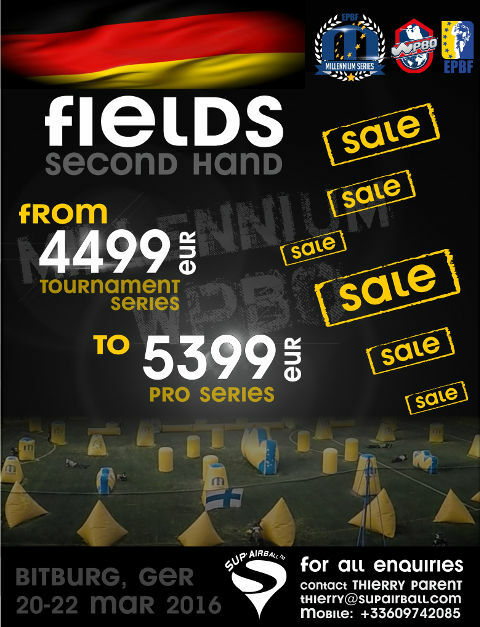 The Bitburg European Masters field layout is online! 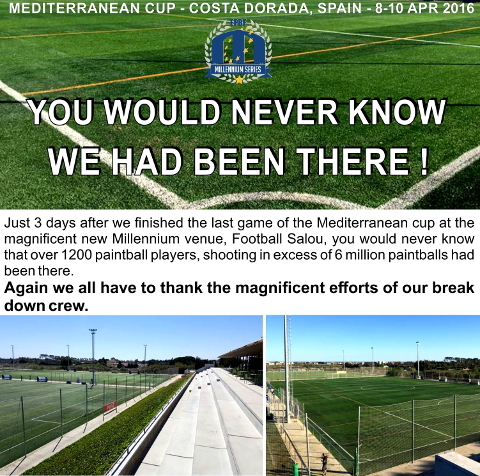 The Millennium Series made its long awaited return to Spain for this year’s opening event & what a fantastic celebration of Paintball it turned out to be; 147 teams, over 300 games, 1073 points played, 3G pitches, full floodlit matches. A World first for an international paintball event with holiday parks, theme parks and roller coasters, pools and beaches, many in walking distance of the playing area. We would like to put out a massive thank you to our incredible build team who pulled out all the stops to ensure all ran smoothly and safe despite the best efforts of Mother Nature. On both the Thursday & Friday, they worked through the night to secure the site and then had to put it all back up to enable play again, apart from one or two pop up tents we had no damage. We must also thank all the players who showed great support, appreciation and understanding when faced with the difficulties high winds present and in general their respect and behaviour both on and off the venue, this goes a long way in the local community to build respect for our sport, which, we hope will allow us to return to this fantastic facility next year. A big thanks goes out to all our industry supporters who help greatly to put on the show at such prestigious venues. With Bitburg coming up fast on the calendar we look forward to another awesome event with it’s very distinctive German feel, the parties, bars and clubs all in walking distance of the fantastic football fields and stadium. We are receiving a lot of early entries right now for the open divisions, and so if you’re thinking about going don’t leave it to long and be disappointed. Come play and Party in Bitburg!